If you're like me you have more than the end of the year on your mind. There's new years eve, sale shopping, un decorating, and lets not forget blogging. I know what you're thinking.... I can't add one more thing to my plate right now. Well now is the time to get re-inspired, brainstorm new ideas and type of content you want to deliver to your readers in 2016. 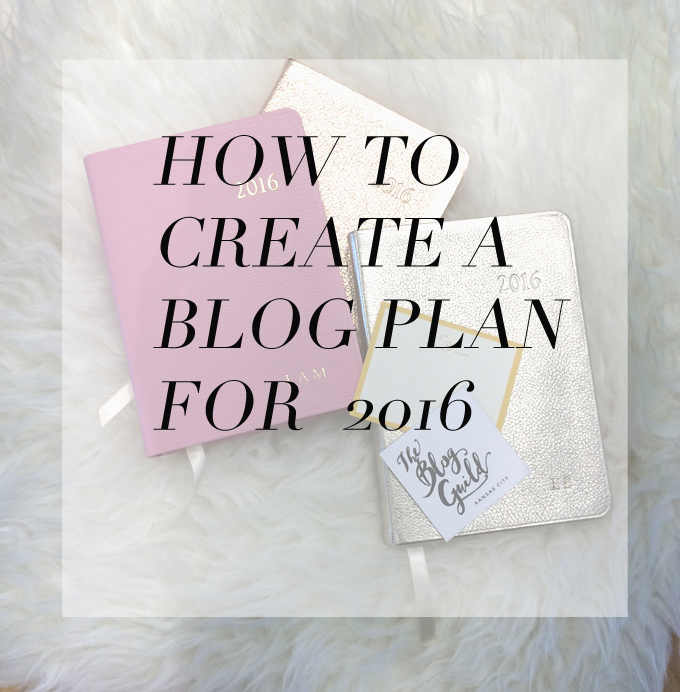 Today, I thought I’d share some of the items I’ve included in my new 2016 blog plan, and how you can write one of your own. I broke it down into manageable bites to make it easier to customize it for your own blog. Why? The most important question in blogging. What is your own personal take away from blogging? If you answered this with "I want to quit my day job and have a viable income to support myself", or " I just wanted a place to share all my fun ideas and be creative", then you have the why! When you started blogging it may have looked drastically different than it does now for you so think carefully about what it is you want in the coming year. Now that you hopefully have the Why...... take a look at your blog and take open notes about what you like about your blog and what you want to see change. I'm not necessarily talking about designs either. I'm referring to content as well. Make a list about what you would change; maybe it's the sidebar content, or your sponsorship, whatever you see write it down. Don't stop just with the visual part either. Your social media is very important and if you are wanting to step up your game you need to make it part of your blog plan. Determining the look for your blog in the new year will help you see your blog plan better. You have the Why; now lets talk abut the what. What worked this past year for you and what didn't turn out so well? Look for any connection between the why you blog and what works for your blog. If sponsorship is important and you want to make money then you have a direction. It worked for you! If you tried it and it wasn't any fun because so much in involved working with brands then you cross it off. This makes your vision for your blog much easier and you can align yourself with your goals. Hopefully by now you have a clearer picture of where you want your blog to go and taking it there should be much easier; now to get down to the details. Mission. What is the mission for your blog? Do you have a mission statement? If not you should. For example a part of the mission statement for The Blog Guild is to create, connect, and collaborate. You can read the entire mission statement here. Having a mission statement will help with your blog vision. Creating Content. Part of your plan should include a list of your topics and categories. Maybe you have an entire tutorial you want to share. Break it in to sections and create a series. Start making a list of all your topics that would be relevant to your blog brand. Some of mine are fashion, style, beauty, and DIY. Once you have your categories then break it down even further into sub categories. For example under beauty there could be product reviews, beauty tips, organic products. You get the idea. Education. So let's say you want to add beauty to your blog in the coming year but you don't feel like you are 100% on your tutorial. Better educate yourself on the topic. Watch you tubes, make appointments at cosmetic counters; you can pick up some great tips from the ladies at the counters!! Practice. Before you know it you will be ready to start sharing. Make that part of your blog plan to set a deadline for when you will integrate the new topic on your blog. We will talk more about your blog plan with your editorial calendar later. Take a photography class. Sign up for a workshop, or maybe there is a conference convenient you can attend. Use the tools you have available to up your game. Did you sign up for The Blog Guild workshop? It's the perfect way to start off your new year and learn all about pretty images to share on your social media and flat lays. And Since we are speaking of social media that brings me to our next topic. Take a photography class. Social Media. There are so many ways of sharing and how and what you share is equally important. Engagement is critical. Being available to your followers is important. Try to answer questions and thank someone when they ask a question or comment. Let them know you appreciate them. Decide what you want to post during the week and have all your pics edited and ready to go on Sunday evening. I had a plan this past year to grow my instagram following; watching the followers grow was exciting. Increase how often you post. If you are not posting every day then start. If you can aim to post 2-3 times a day, but if you're not even posting daily then shot for once a day to start with! Engagement is critical for your current followers as well as potential new followers. Brands like to see you engage and are always checking so if you are planning to, or currently monetizing then keep this in mind. That brings me to the next topic. Monetizing. Pay attention to this one, its tricky. If you are already monetizing that's great. If it's working good then see what you can do to step it up. (See previous paragraph regarding social media and posting regularly) If you want to start this year monetizing there are platforms like Reward Styles for your blog and Like to Know it with instagram, there is also ShopSense but I don't work with them so I am not familiar with them but know several bloggers who are successful with them. You can reach out to brand and pitch an idea to work together. Be precise with your pitch and what you expect from the brand and what you will deliver. Get it in writing is always important. I recommend you research the legal aspects to income streams via blogging and make sure you adhere to the disclosure laws. If you do choose to work with brands this is something you would add to your blog plan with your financial expectations and show how much you would like to make each quarter and how you will make it. New plans. Ok, so we have pretty much covered everything bit growth. Your plan is great and it sustains you for the year but you have to add new projects for growth. There are several ways to increase your audience. Do you currently have a newsletter? Entice your followers to sign up by letting them know you are sharing things different than what they find on the blog. Again, attend a workshop to learn a new skill. I can't tell you how much I value the investment to attend a I Heart Blog Shop class. I learned how to really use photo shop and it increased not only my skill level but my confidence in my layouts. Did you sign up for The Blog Guild workshop yet? You can find out more about it here. So are you ready to start planning? You can write it out however you want. I am a paper kinda gal but Paper, word, Google docs, whatever works for you. Don't worry, your plan will look different from everyone else's. It should be unique to you! There are other elements you may incorporate into your planning. Traffic, networking and creating connections to only name a few. Taking the next step. Research the class you would like to take; signup! Block some time and explore with your camera and learn all about what you can really do with it. Look in your community for other local bloggers. We have a fantastic network locally we all connect with; The Blog Guild.